Oiled muscles, perfect poses, and a speedo round out the image of a Mr. Olympia contestant. Contestants at the world’s ultimate bodybuilding competition are presented as physical ideals, but they often play a second role: as poster boys for the hidden dangers of body image issues, such as muscle dysmorphia or bulimia. These competitors and their extreme appearance remind us of the very real body image issues present in society, afflicting even those closest to us with an unattainable quest for physical perfection. We looked at the evolution of a Mr. Olympia winner’s physique over the last 50 years, and how it compares with that of an average American man. We wanted to know the answers to three questions: How normal or abnormal is the quest to win one of bodybuilding’s top honors? Does the pursuit of this goal necessarily qualify as a body image issue? Are steroids part of the equation? By 1965, Mr. Olympia contestants were already competing in a post-steroid era for the sport. Anabolic steroids entered onto the scene of competitive bodybuilding in the 1960s, distorting the standard for what natural muscle-building looks like. In the 2000s, massive thighs and shoulder muscles were common. This transformation shows plenty of men who, based simply on appearance, couldn’t be described as average. Arnold Schwarzenegger, for example, changed dramatically in the times he won, first in 1970 as a much leaner victor, to later a much larger and muscular competitor in the mid 70s and 80s. While consuming a balanced diet, exercising regularly, and taking care of your body is a positive way to approach fitness, the sport of bodybuilding has promoted a goal mostly only obtainable by taking steroids, which can have extreme, or deadly, repercussions. That contestants pursue this goal, in spite of the dangers, suggests a willingness “at all costs” to achieve a desired state of muscularity, where now their bodies are in a state of reverse anorexia or bigorexia. 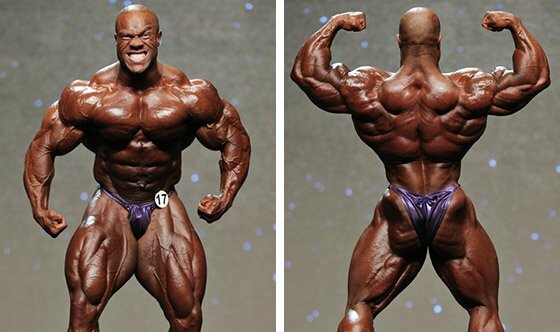 As the graphics put together by bulimia.com show, the winning poses of Mr. Olympia winners may not have changed over time, but as the model of what is perceived body perfection has evolved, so have the contestants. It took the introduction of steroids to further alter the appearance of these men, and some contestants, most notably Arnold, shared that they have “no regrets” for taking steroids on the path to victory. Contestants who used steroids placed themselves at increased risk of a heart attack, liver damage, or shrunken testicles. Pursuing a championship physique shouldn’t require endangering your entire body, and the long-term side effects of steroids presented a clear need for the competition to partner with professional support. The regulatory body that oversee the Mr. Olympia competition – the International Federation of Bodybuilding – adopted the World Anti-Doping Code in 2003 and have continued working to keep the sport free of steroids and other banned substances. As smart as these bodies are they’re competing some less scrupulous athletes, the kind who like winning at any costs, who keep inventing ways to stay ahead of the tests. 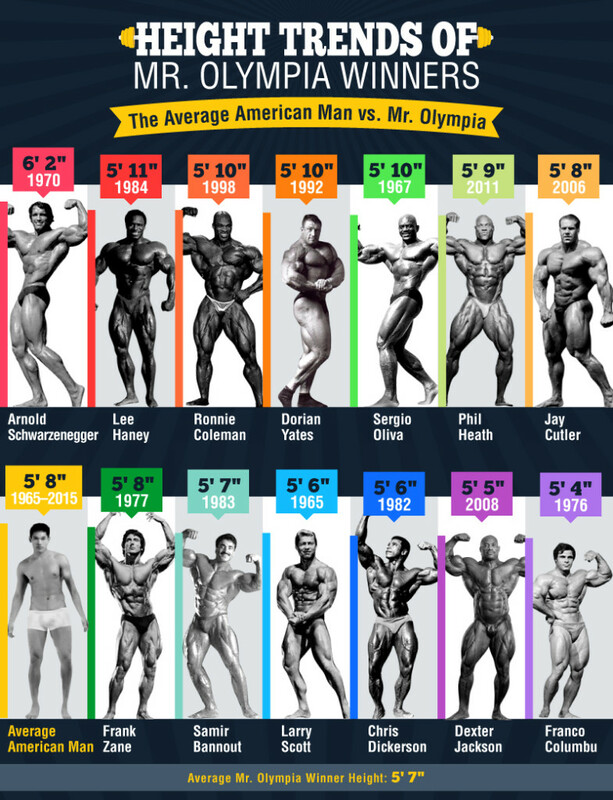 When looking at the heights of Mr. Olympia winners, we found their average height was 5 feet 7 inches, shorter than the average American man. Except for a few outliers – Arnold Schwarzenegger, Lee Haney, and Ronnie Coleman – every winner landed at, or shorter than, the height of the average American man. It may be that shorter height helped these contestants to appear proportionally bulkier, giving them an advantage in the competition. It’s also possible that shorter men are more likely to go into bodybuilding to increase their overall size. There are statistics that suggest a perceived connection between a man’s height and his masculinity – a man who is 6 feet tall or taller is 33 percent more likely to secure a date online than a man of average height, for instance. This could lead to body image sensitivity that motivates average size men to try anything – including steroids – to achieve the size they want. With so much competing information about what a healthy body is or looks like, it’s no wonder the subject calls for both confusion and sensitivity. When looking at BMI (Body Mass Index), you can generally tell whether someone is below, above, or within a healthy weight range. However, the BMI’s ability to place more muscular individuals appropriately is a question mark, since increased muscle mass is just factored in as additional weight. The Center for Disease Control (CDC) points out that the tool might only serve as a rough guide for athletes, and recommends partnering with a health care professional. Only one Mr. Olympia, Frank Zane, had a BMI that was close to that of an average American man. 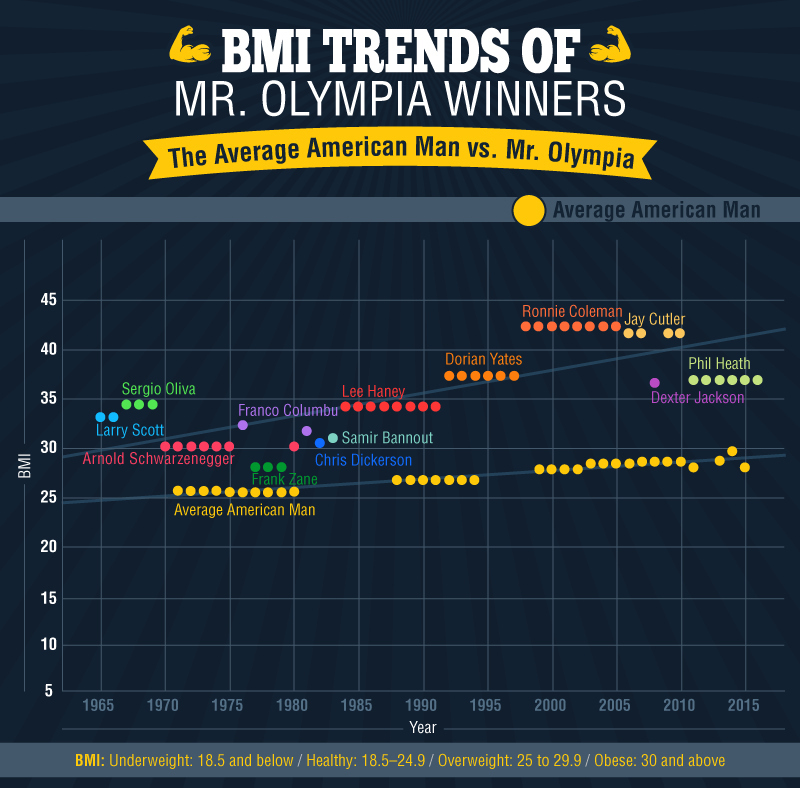 Ronnie Coleman, on the other hand, was winning Mr. Olympia competitions in the late 1990s through mid-2000s with a BMI that technically classified as “obese.” We charted the average American male overtime to reflect the changes in their BMI relatively to the years. Bodybuilding can be a safe sport, but it glamorizes the unhealthy pursuit of an unnaturally obtainable physique. Many of these competitors have to rely on steroids, while gambling with its dangerous side effects, in their pursuit of a body that aligns with the standards of their competitors. Just because they are winning competitions based on looks and lifts, doesn’t mean that these bodybuilders are models of perfection. It’s likely they’re carrying the heavy burden of body image issues by themselves. Don’t fight this battle alone. Find support with Bulimia.com via the web, or by phone at 1-888-232-6949, to learn more about these conditions and how we can help. We gathered historical measurements of Mr. Olympia winners from 1965 to 2016. Measurements for the average American man were obtained from the Anthropometric Reference Data for Children and Adults report from the CDC for available years between 1965 and 2016. The average man’s height and weight reflect men aged between 20 and 74. BMI was calculated using the formula weight (lb.) / [height (in)]2 x 703.